Play is how young children learn about their world. Their curiosity, creativity, joy of living, and sense of wonder flourish in an atmosphere of play. Children learn cooperation, independence, resilience, and the concept that there are many ways to solve a problem. Play provides a stress-free, natural way to develop all the pre-academic skills. They gain mastery over their bodies, deal with conflicting emotions, and negotiate complex relationships with their peers. Children learn to become learners, which is among the greatest gifts they can take with them for a lifetime. 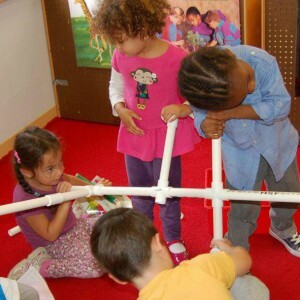 We are a small, nurturing preschool in Albany, NY that uses a self-directed play-based curriculum as its core learning strategy. Young children learn best through play, and that is what we do every day. We offer programs for 3 to 5 year olds. 3-year-olds meet Tuesdays and Thursdays from 9 to 11:45 a.m.
St. Vincent’s Preschool is sponsored by the Church of St. Vincent de Paul, Albany. Our program uses an interfaith approach, with prayers of thanks and praise at appropriate times. We welcome families of all religious traditions. The best way to learn more about us is to schedule a visit to our school! Please call or email to arrange a time to visit.